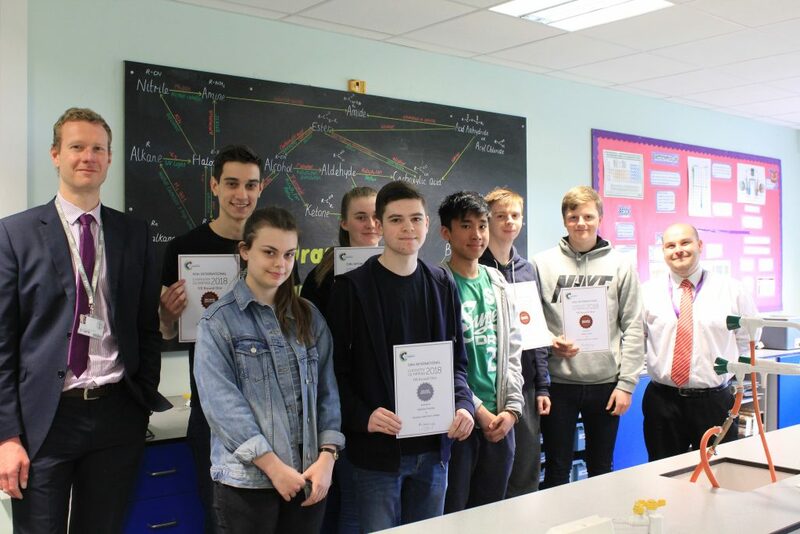 Students at Stockton Sixth Form were recognised for their achievement in the 2018 Chemistry Olympiad. The Chemistry Olympiad is a nationally run competition from the Royal Society of Chemistry for students aged 16 – 19, capable of achieving high grades in Chemistry. Only the top 3500 students in the country are capable of achieving an award in this competition and so to have so many of our students do so well is a credit to themselves and to the Sixth Form College. Josie Almen (OLSB) – Silver Award, Matthew Priestley (Grangefield) – Silver Award, Callum Russell (OLSB) – Bronze Award, Dominic Scott (OLSB) – Bronze Award, Tom Bell (Ian Ramsey) – Bronze Award, Charlie Paylor (Bishopsgarth) – Bronze Award, William Hulyer (Ian Ramsey) – Bronze Award, Rachael Walls (Ian Ramsey) – Bronze Award, Helen Hoyle (Grangefield) – Commendation and Aldwin Panela (OLSB) – Commendation.